During their first 20 day stage of the activity cycle, the queen will lay up to 100,000 eggs. The eggs are then taken away and stored in the bivouac's central area (Encyclopedia of Life 2013, Animal Diversity 2012). The queen mates only once, but has an ability to store enough sperm to fertilize all of the eggs with one mating session. Although more research is needed for accuracy, the queen alone will participate in five mating sessions in her lifetime. When a winged male worker is found, the other workers will bring that worker to the queen in which she will mate with. This is considered a polyandrous mating system, or mating with several different males within a season (Animal Diversity 2012). After about a 48 hour period, the male that mated dies. This is a very excellent and elaborate form of sexual selection for genetic diversity. These eggs hatch at the end of the 20 day period, and the nomadic phase begins. During the nomadic phase, the colony exits the bivouac and moves to a different area where the raids then become more frequent and intense in order to feed the new hatchlings (Encyclopedia of Life 2013, Animal Diversity 2012). The larvae in the eggs go into metamorphosis near the end of the 20 day bivouac phase. The new larvae goes through five stages before metamorphosis begins. At the end of the metamorphosis, the adult forms eclose, or emerge from the egg. 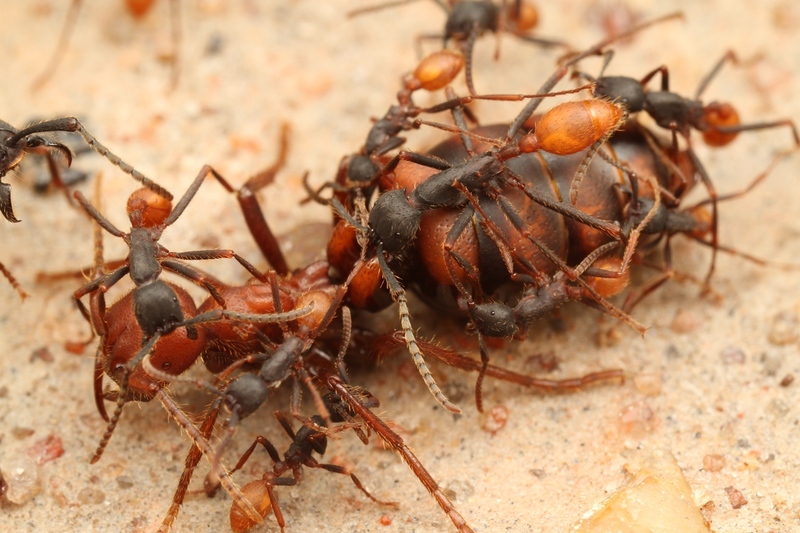 The existing workers help the new Army Ants eclose from their cocoons. 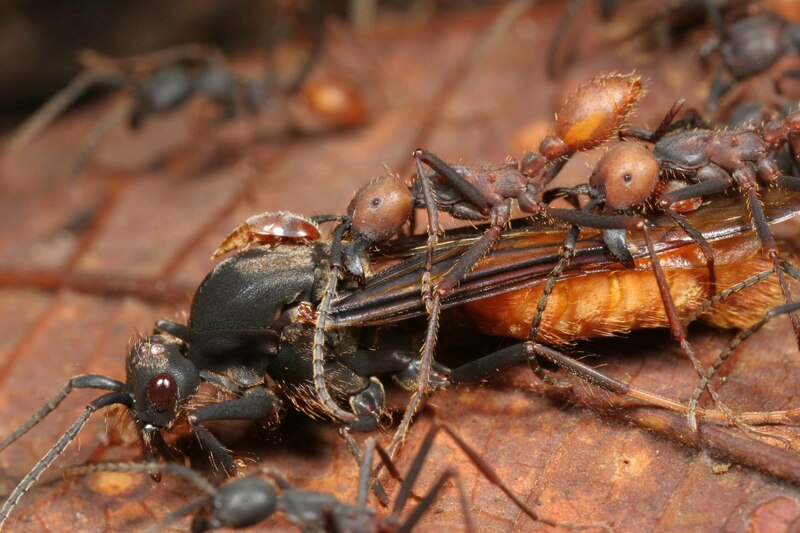 The result is the new Army Ant adults (Animal Diversity 2012, Encyclopedia of Life 2013). It is very difficult to keep this species in captivity, so estimated lifetimes are very rough in accuracy. There are some age estimates for the specific positions in the Army Ant heirarchal system. Workers will live for months at a time while the queens of the hive will live for multiple years (Animal Diversity 2012). At random times of a colony's life, queens will be born from a spawn of larvae. This is the signal of new colonies being born. The queens have no wings, so the workers will care for the new queens while still in the parent colony. When the new queen fully develops, the colony will completaly separate, but until that time the workers will shuffle between parent and external colonies (Encyclopedia of Life 2013).